I have to mention the gorgeous packaging too – the solid box with little pouch holds a stunning shiny golden bottle that’s really solid and quality feeling with an equally heavy lid that magnetically attaches to the bottle. To celebrate the two new scents going on sale at Selfridges (where it was exclusively launched) I was invited to come along, give them a good sniff, pick a favourite and also get the bottle engraved – so I decided to get my blog name! Probably just me, but I adore it! Black Oudh contains laurel leaf, black oudh, black must and amber. Creating an intense, woody, smoky scent. 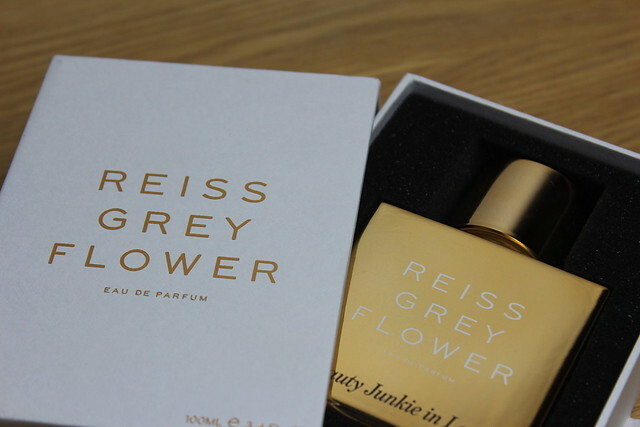 Grey Flower is another rich fragrance with pimento berry, patchouli, amber, sequoia wood and frankincense. Managing to be rich at the same time as feminine. I can happily say these two fragrances are far from the typical or like anything I’ve smelt before – they’re unique and classy and simple all at the same time and perfectly capture the stlyle of Reiss. That little bit classic, that little bit simple and sophisticated but with that little bit of an edge of something different and unique. The bottle isn’t exactly travel friendly – but it is a beauty!